I have an ongoing argument with a friend whether one’s favorite food can be simply “carbs” (my stock answer to this enquiry). She claims that’s too general to be a favorite food. But I, the granddaughter of a dry land wheat farmer in northern Montana, the great-granddaughter of farmers from Norway, disagree, disagree—though I suppose it is more accurate to say that my favorite foods all fall under the “starch” category. I guess in a way, wheat is in my blood. The planting, watchful waiting, and harvesting formed the outlines of my father’s young life. And while I grew up in the city, far removed from the tractors and praying for rain, “the crops” were still present, in the form of keen attention to weather, in the large garden my parents cultivated each year in our backyard, in old ice cream buckets filled with flour delivered by my grandparents. Flour Bakery never disappoints. Today's choice: lemon ginger scone and my usual window seat. In my own childhood, there was always bread—being baked and being eaten, warm, straight out of our 1990’s, height-of-kitchen-gadgetry-cool breadmaker. I maintain still after my many culinary adventures that there are few things better than a warm slice a bread with butter. As I sit here on January 3rd writing this first post, the east coast is preparing for a mammoth blizzard that that forecasters warn us will become a “bomb cyclone” and bring yet another day of frigid temperatures. As usual, I’m seeking solace in one of my favorite spots—Flour Bakery and a lemon ginger scone. I can’t change the weather outside, but I can change the way I’m feeling inside with this little treat. What’s more comforting than a delicious pastry? This project began during a trip to Norway with my family in March 2017. We were all still grappling with the new world of Donald-Trump-as-President. He’d blown into office in a bloviating blur, been greeted by both tiny inauguration crowds and the largest protest in political history, royally bungled a Muslim ban and generally broken every norm we thought (to our dismay) was a rule. With a stressful few weeks behind me, and the frigid New England winter left behind, I arrived in Norway ready for a break and, to my delight, was greeted by a country full of the most delicious, comforting baked goods I could desire. The first of many delicious kanelboller in Norway. My first morning in Oslo, I set out from my miniature hotel room in pursuit of my first taste at the well-known Åpent Bakeri. 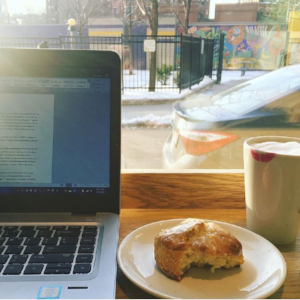 As I soaked in the crisp air and was warmed by the bright sun on their airy patio, I had my first taste of what would prove to be the first of many kanelboller (“cinnamon bun”) in the coming week. That happy moment was the escape I needed, and (late Millenial that I am) of course I instagrammed it and #pastriesforpresident was born. To my surprise and delight, this silly side project proved to be popular among my friends, near and far. I came home to lots of questions, comments and mouthwatering inquiries in regards to my carb-filled adventures, and I so I continued to document my pastry adventures. This year, I’m rolling #pastriesforpresident into this writing project, “In Pursuit of Pastry”, where I hope to showcase two of my greatest joys in life: exploring places both near and far from home along with all the delicious pastries I always seek out along the way. You can follow along on Instagram at @inpursuitofpastry. My goal is at least one pastry, and thus one entry here, per week. It feels like a modest proposal. Here goes nothing.